On Friday, Palestinians worldwide will commemorate those who have died and suffered resisting Israel’s decades-long policy of seizing Palestinian land. 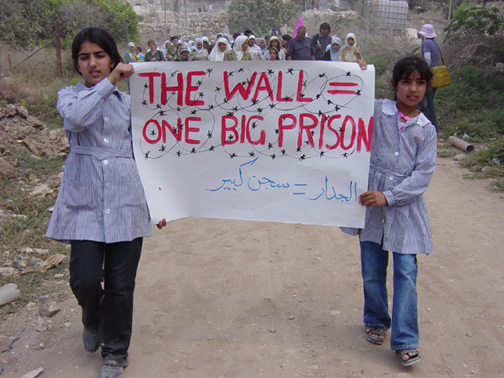 Demonstrations will occur through May 15, the 70th anniversary of the Nakba, or “catastrophe,” when over 700,000 Palestinians out of a population of 1.9 million were expelled from their homes following the declaration of the State of Israel. Adding insult to injury, the U.S’s highly contested embassy move to Jerusalem will coincide with Nakba Day. Palestinians have plenty to protest in the upcoming weeks. The systematic expropriation of Palestinian land continues unabated, and the development of Israeli settlements — well-funded, fortified hilltop cities built in Palestinian territories — has intensified. Just a few months ago, Israeli Prime Minister Benjamin Netanyahu approved building plans for 3,736 new settlement units, announcing “we are here to stay.” Almost 600,000 Israeli citizens currently reside in settlements — a population growing at a rate two times higher than that within Israel. I recently witnessed the impact of Israel’s land grab and development strategy in the occupied Palestinian territories with a Global Exchange delegation. We heard from Palestinians dispossessed of their lands and homes for alleged security reasons only to later find mobile homes (or, “outposts”) mark the groundbreaking of yet more Israeli subsidized settlements. We maneuvered fairly freely via an expansive network of Israeli-only bypass roads and highways conveniently linking settlements to each other and facilitating movement to and from Israel. Conversely, we observed hundreds of checkpoints, walls, permit requirements, and Israeli soldiers tightly confining Palestinians to ever shrinking territory. I discovered that this maze of control makes it so a Palestinian might grow up able to view the Mediterranean from her town without ever having received a permit allowing her to travel to its shore. Several Palestinian teens expressed dreams of one day touching the sea. Israel justifies many of its land grabs and extensive system of control in the West Bank as defensive measures proportionate to the threat of Palestinian and Arab aggression. Recent history is often referenced: like the 1967 Six-Day War provoked by a coalition of neighboring Arab states, two Palestinian Intifadas, or uprisings, in 1987 and in 2000, and Palestinian suicide bombings targeting Israeli civilians – a strategy that gained traction during the Intifada. Palestinians, though, view Israel’s security justification as yet another pretext to displace them from their homes. It’s seen as a palatable guise for Israel’s century long “colonial gentrification” of historic Palestine — the uprooting of indigenous peoples by settlers and imperialist powers. While impossible to list the litany of historic grievances, Palestinians often reference the demographic history of the Southern Levant, a region that for hundreds of years has been overwhelmingly populated by an Arab Muslim majority and Arab Christian and Jewish minority. The 1917 Balfour Declaration (whereby the British declared that the then Ottoman region would become a Jewish national home, despite Jews only accounting for 3-5 percent of the population at the time) is referenced as a destructive political landmark that, along with the 1947 United Nations Partition Resolution 181, paved the way for the formation of the Jewish state in 1948 against the will of indigenous populations. This was Judea before it was Palestine. The Romans named it Philistina after the Philistines, our enemies, to humiliate us, rebrand us, and erase our identity. 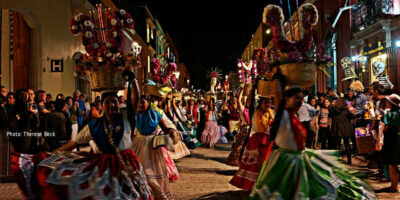 They overran us and dispersed us, and we lived around the world for thousands of years. 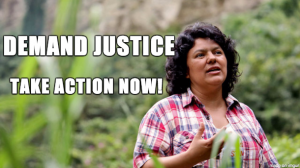 We are unique in that we are a people with a memory that compelled us to return to our ancient homeland — and we came back. Indeed, perhaps the most honest justification for the settlements given from a settler was about power — that we live in a world of winners and losers where winners enjoy the spoils of war and losers suffer. Indeed, the ugliness of this logic reflect the facts on the ground today: the highly securitized apartheid reality accompanying growing Israeli settlements is causing tremendous suffering to Palestinians. Squashed into ever shrinking towns with no territorial contiguity, it’s no wonder Palestinians tend to describe their situation as “living under siege” on “islands surrounded by a sea of Israeli control.” Instead of creating conditions necessary for a future sovereign Palestinian state, the West Bank is being carved up in such a way that makes a two-state solution practically impossible. 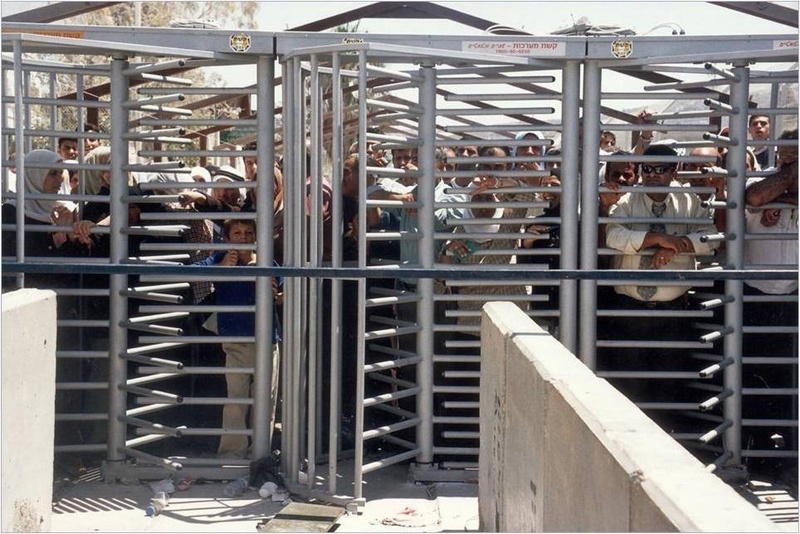 Palestinians stuck at a checkpoint. Iyad Burnat is the head of the Bil’in Popular Committee against the Israeli wall and settlements. In response to the continuous uprooting of Palestinian ancient olive trees and confiscation of farmland, the main income source for Bil’in residents, Iyad has led weekly non-violent actions since 2005. This picture was taken while Fadeyeh and Ne’ameh walked two-miles to their land. 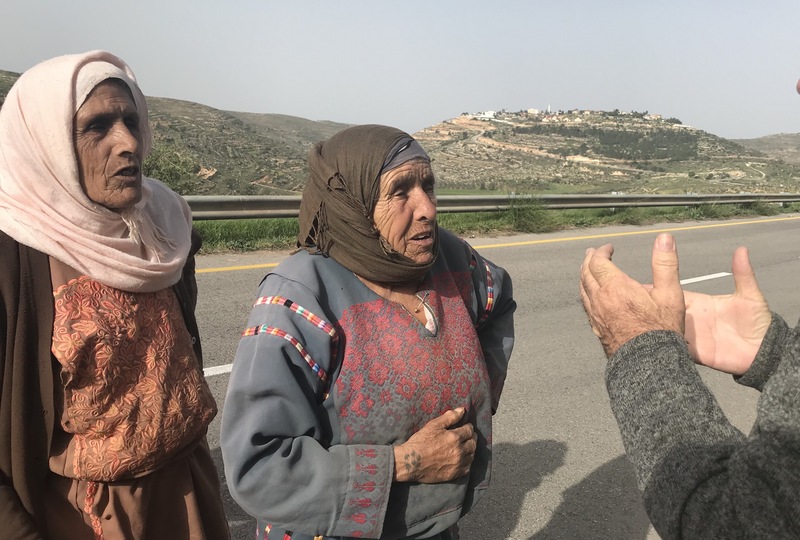 Farming sisters Fadeyeh and Ne’ameh were cut off from their land after it was seized to form part of a so-called “security” buffer zone around a settlement. The creation of these special security areas became common in the wake of the second Intifada when suicide bombings that targeted Israeli civilians became a common tactic used by Palestinian armed resistance groups. This picture was taken in this Bil’in farmer’s new greenhouse, an agricultural technology effective for conserving water. He’ll grow tomatoes, “inshallah” — God willing. 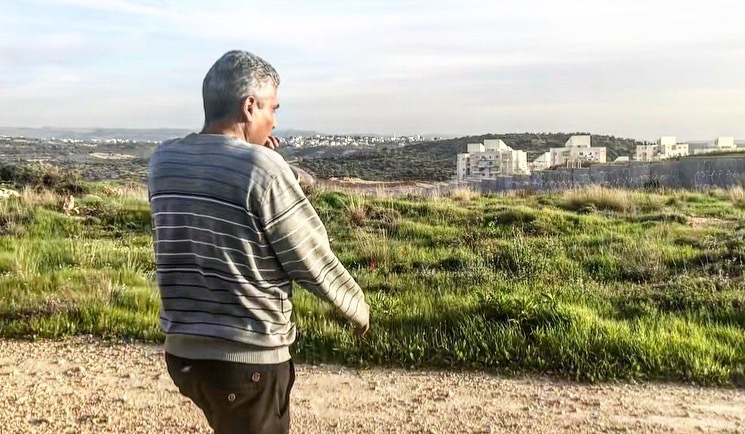 The Bil’in farmer pictured below was cut off from much of the land he and his family once farmed to accommodate the construction of a separation wall and buffer zone for the neighboring Israeli Modi’in Illit bloc. 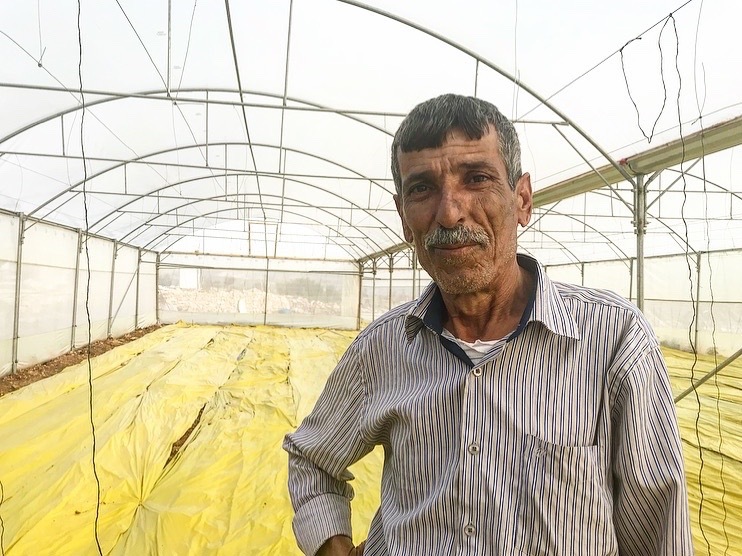 Like Fadeyeh and Ne’ameh, he could apply for a permit but is discouraged by the fact that only forty percent of requests to enter the annexed agricultural land receive positive response. Limits on access have decreased farming in these areas by over eightypercent. Just an eye-shot away, the settlement’s complexes are kept lush by water unavailable to Palestinian farmers. In the West Bank, water is far from evenly shared. On average, Israeli settlers have access to over 300 liters per day, while neighboring Palestinians are left with 73, well below the World Health Organization’s minimum standards of 100. 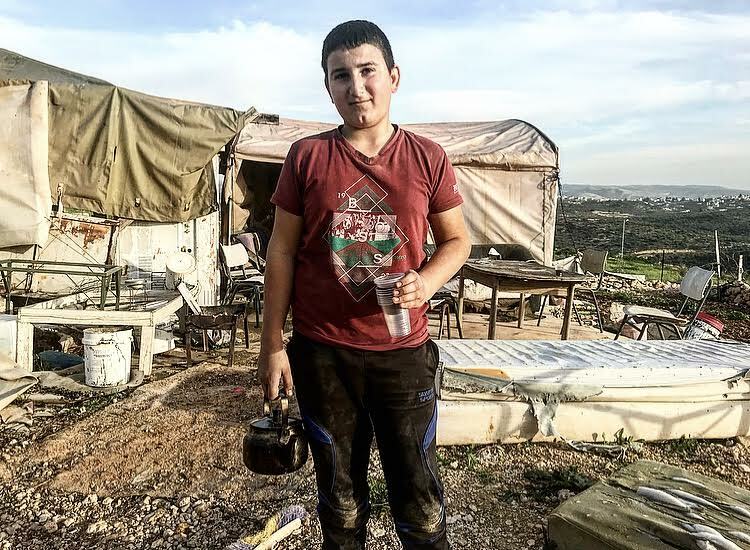 It comes as no surprise that you can distinguish a Palestinian town from an Israeli settlement by seeing if homes are topped with water tanks, or not. Pictured is the Bil’in farmer’s youngest son, kindly ensuring my cup of tea remained full. His hospitality in what’s left of a home that’s been demolished five times was a heartbreaking show of resilience. Israel pursues an aggressive housing demolition policy in the West Bank, a process that the Israeli Committee Against Home Demolition has shown is highly political. Homes are bulldozed for various reasons, including the clearing of vast tracts of land for military / security purposes, building without a permit (even though such permits are disproportionately difficult and expensive for Palestinians to secure), and out of collective punishment, or “deterrence,” against the family of any individual who carries out an attack against an Israeli target. In ninety-five percent of these demolitions, residents had nothing to do with the security offense. These young Palestinian Hebronites cross checkpoints on their way to and from school. Settlement enclaves encroach into Palestinian cities like Hebron where Israelis build homes on top of Palestinian homes and businesses, accompanied by an extensive system of cages and checkpoints that vertically and horizontally partition space. 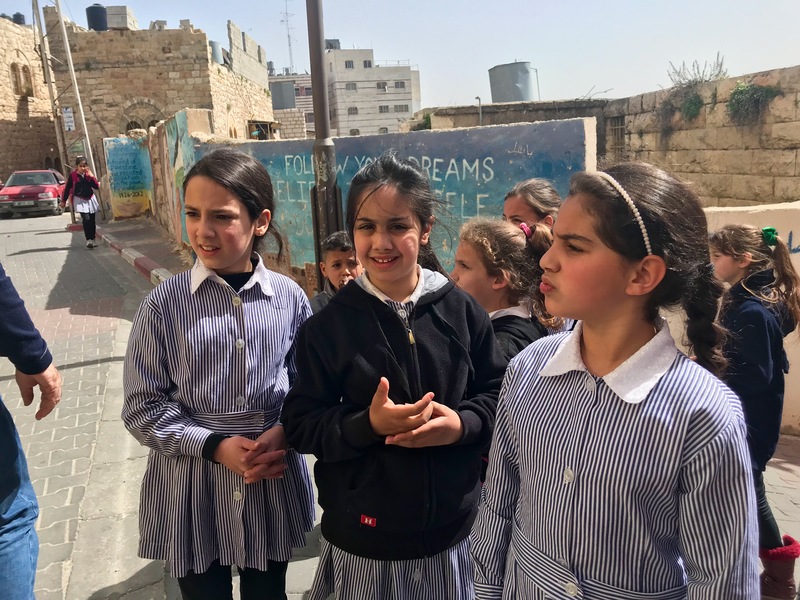 In the old city of Hebron known as Hebron 2, more than 4,200 Palestinian students must cross checkpoints on their way to school. Muhamad Barakat explained that the learning environment has suffered due to the potential for harassment and humiliation students receive while moving through checkpoints. Many opt to move. 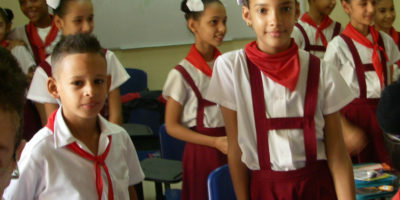 Indeed, the number of students attending Hebron’s Al-Ibrahimi primary school has dropped from 460 in 2011 to 220 in 2017. Follow our Facebook page for updates on events planned for the 70th anniversary of the Nakba in the Bay Area, California, and click here to learn more about Global Exchange delegations to Palestine.